A former top official of a city in northeast China has fled the country - reportedly with millions of dollars, Chinese reports say. Wang Guoqiang, who was party secretary of Fengcheng city in Liaoning province, left for the United States in April with his wife, the People's Daily said. Local officials said Mr Wang, who was being investigated for corruption, had been removed from his post, it said. Several reports cited 200m yuan ($31.5m; £20m) as the amount taken. The local officials did not elaborate on allegations that he had embezzled and transferred the funds to the US, where his family is believed to be. But rumours surrounding the case, the latest in a series of corruption scandals, have been circulating online for some time. According to the city's website, Mayor Ma Yanchuan took over as Fengcheng party secretary earlier this month. Premier Wen Jiabao has repeatedly called corruption the biggest threat to Chinese Communist Party rule. Corruption among officials remains a huge source of anger among China's population, says the BBC's Martin Patience in Beijing. While the finances of the top leaders are off limits, many other senior officials have been brought down by scandals, says our correspondent. An opinion piece published in the Global Times called on authorities in the province to reveal more information about the case so as to curb public speculation. ''Wang's flight is certainly a scandal. It would be good for the officials if such a scandal could be hidden, but that's hardly realistic,'' it said. 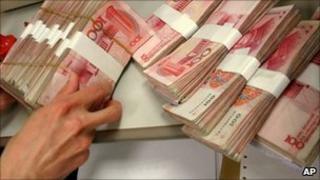 A report released by China's central bank last year said more than $120bn (£74bn) had been stolen by corrupt officials who fled overseas, mainly to the US. Between 16,000 and 18,000 officials and employees of state-owned companies left China with the funds from the mid-1990s up until 2008, the report said.